Specification:Package content: 4 x Caster WheelsMaterial: Polyurethane and SteelWheel Size: 3'' DiameterCapacity LBS: 1200 Lbs (300 Each)Colors: RedTop Plate size: 91 x 64mm / 3.6 x 2.5 inch (L x W)Height: 4.0 inchNet Weight: 5 PoundsSpecial feature: Lockable and SwivelBearing: RollerFeatures: Steel material, durable and anti-wearNOTE:Due to the difference between different monitors, the picture may not reflect the actual color of the item. But we guarantee the style is the same as shown in the pictures. Thanks for understanding.100% GURANTEE:If there is any problem with our caster, we will send you a new one for free or full refund to you. CasterHQ Brand offers a direct replacement for all Rubbermaid Cart Casters 4400, 4500 Series Carts. Wheels are a high quality non-marking (TPR) Thermo Plastic Rubber material. 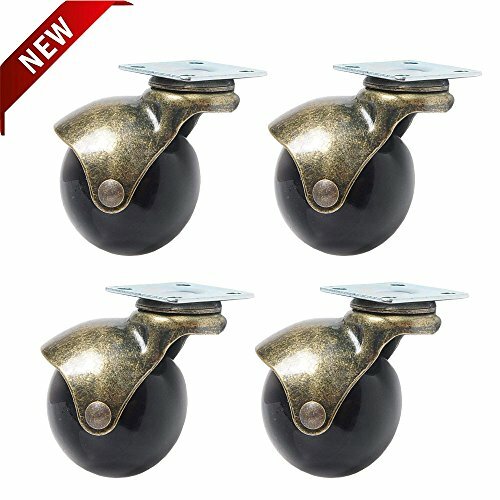 Includes 2 Swivel casters and 2 Stationary Casters. 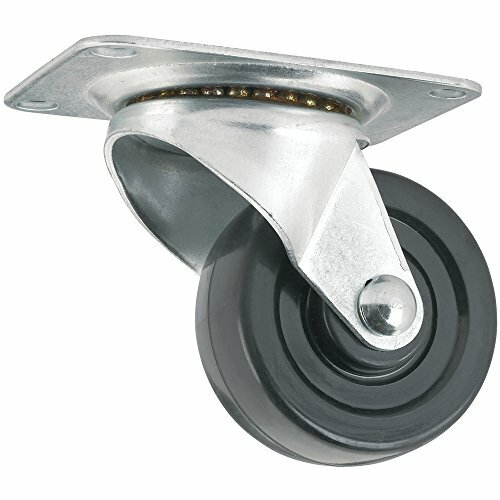 Will Replace casters on all 4400 Series and 4500 Series Rubbermaid Carts. 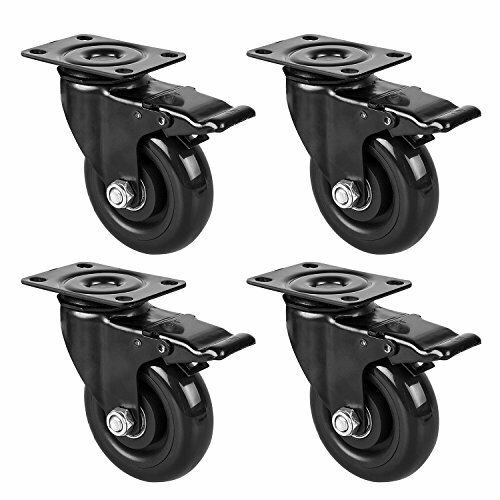 Will replace Rubbermaid cart casters for the following cart series: 4300, 4401, 4500-27, 4500-88, 4500-89, 4505-00, 4505-89, 4520-88, 4520-89, 4525, 4525-89, 6180 & 6180-88. Products and listing are copyrighted and registered by CasterHQ. Features: Lockable, each caster has its own brake -- Effective to stop the device when there is no body to hold it, and prevent it hurting others. 360 Degree swivel, roll smoothly -- Easy to transform to any directions that you want. 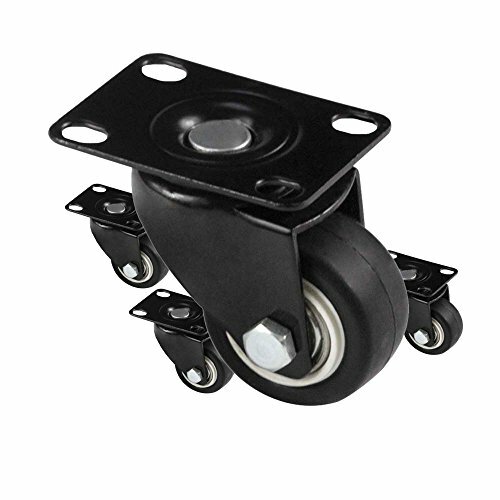 Quite rubber base wheels -- Don't worry to awake your baby or disturb others when move your furnitures that with the plate casters. Widely use -- Perfect for furniture, including coffee table, plant stands, bookshelves, shoe bins, toy bins, underbed storage, shopping carts, workbench. Save strength -- If the furniture has caster wheel, you will be very easy to move them when change house or doing cleaning. 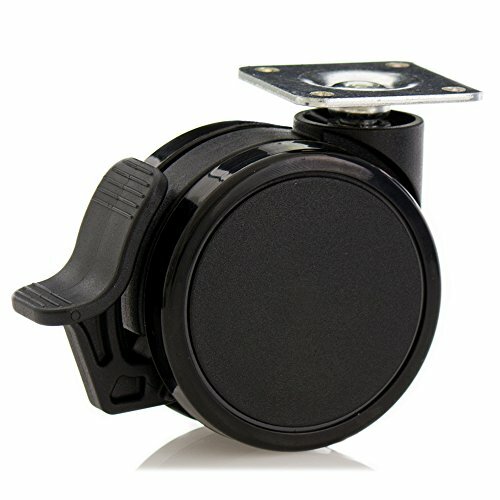 Specification: Material: Rubber Wheel, Steel Top Plate Wheel Diameter: 3.74inch/9.5cm Wheel Width: 1.18inch/3cm Top Plate Size: 2.55x3.74inch/6.5x9.5cm Total Height: 5.11inch/13cm Load Capacity: 750LB (250*3) Package Content: 4 x Casters (no screws) Notice: 1.Please allow slight measurement deviation for the data. 2.Please contact me feel free if you have any hesitation about the product. 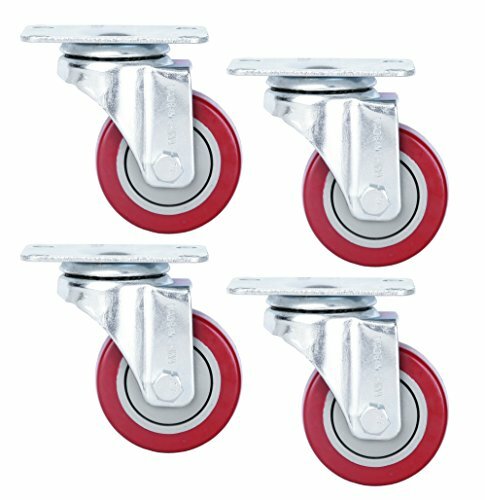 The Caster Wheel Installation is divided into 4 kinds , Befor you add to cart, please determine what installation you want. installation: Brake*4, Non Brake*4,Brake*2 Stable*2, Non Brake*2 Stable*2. Wheel material for high quality polyurethane raw material, with high mechanical strength, wear resistance, shock absorption, and other functions, safe for all floor types With the support of steel sets of double ball bearings, so that the wheels are more stable and bearing. Work on any Hardwood Floor ceramic wood carpet cement paint without scratching Wheel diameter 50mm Wheel width: 20mm Installation height: 70mm We are a professional supplier specializing in furniture manufacturing and developing, all our products are made of high quality materials and excellent manufacturing process, we are very confident of our products quality. If you occasionally receive a defective item which is likely to be damaged during shipping, please feel free to contact us, and we will provide you the highest standard of customer service. 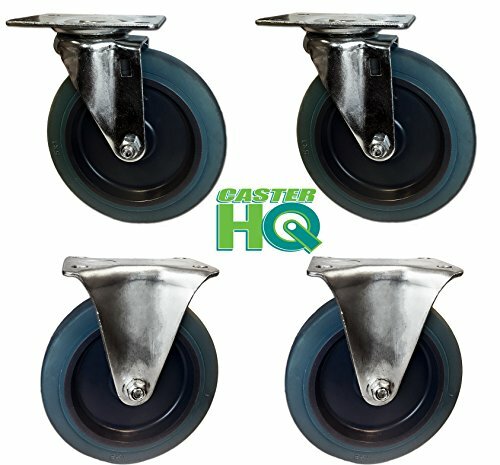 bayite 2 inch Swivel Caster Wheels with 360 Degree Top Plate - Make it much more easily to move small equipment and small space furniture Wheel dia. : 2"(50mm)Wheel width: 1"(25mm) Plate Size :2.75" (70mm) x 2" (50mm) Hole center to hole center: 2''(50mm) ×1.38''(35mm)Overall Height: 2.83"(72mm) Mounting hole dimensions: 8.5 x 11.5mm/0.33'' x 0.45'' Packaged: 4 casters (2 casters with brakes)100% satisfaction and RISK FREE warranty:1 year free replacement or full refund without return. If the item you have received is defective or damaged in any way, please contact we SELLER instead of amazon by clicking the link of "Ask Seller" in your order details. You can get a replacement or a full refund with no need to return the item.bayite provides hassle-free service. 100% satisfaction guaranteed. Waxman offers a complete line of casters and wheels for a variety of consumer and industrial needs. These items are high quality and built with durability and versatility in mind. For use on: Bed Frames, Desks, Dressers, TV Stands, Chairs, Carts, Tables, Stools, Toolboxes, Planters, and more. The top mounting plate for this caster is 2.61” by 1.88”. The bolt pattern, which is the distance between each installed bolt, is 2.14” by 0.94”. The diameter of each bolt hole is 0.2715”. 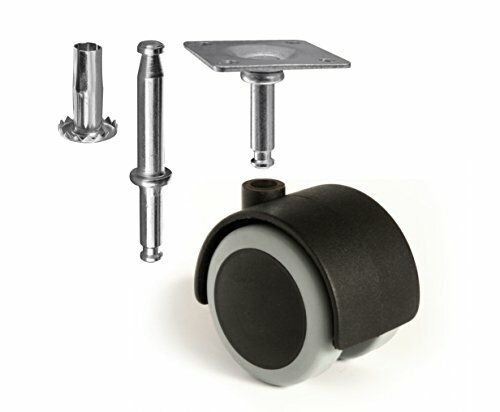 When this caster is installed, it adds an additional 2.49” of overall height to the item you are attaching it to. 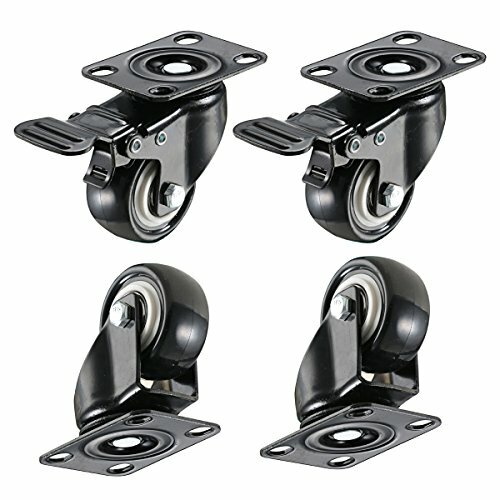 Compare prices on Replacement Plate Caster at Shopsimal.com – use promo codes and coupons for best offers and deals. We work hard to get you amazing deals and collect all avail hot offers online and represent it in one place for the customers. Now our visitors can leverage benefits of big brands and heavy discounts available for that day and for famous brands.